Joe Gaziano engages an offensive lineman. The sophomore defensive end has six sacks this season. With a team-leading six sacks to his name already this season, sophomore defensive end Joe Gaziano is well on his way to becoming a household name on Northwestern’s defense. But Gaziano’s teammates prefer some alternatives. As intimidating as the 6-foot-4, 280-pound lineman may appear, Gaziano’s personality makes some lighthearted ribbing a safe venture for his teammates. But the same can’t be said for opposing quarterbacks who stare down the Wildcats’ No. 97. 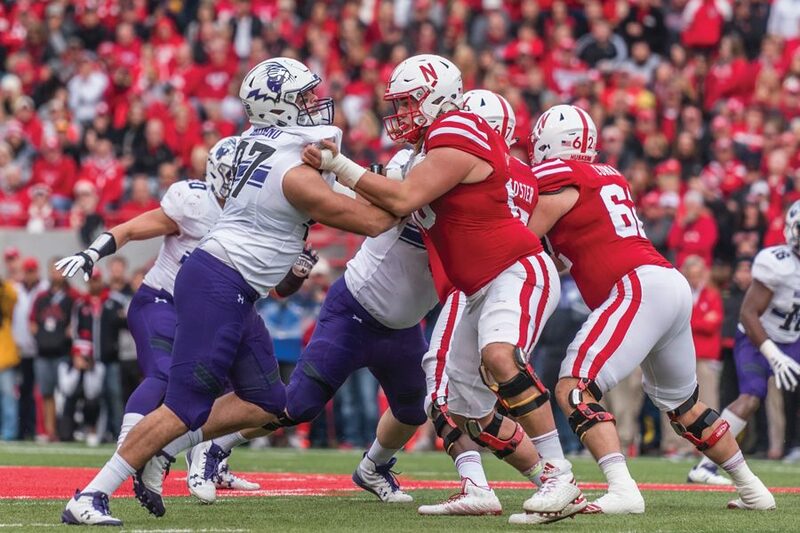 Starting with his first career sack last year — an instant highlight-reel demolition of Michigan State’s Brian Lewerke in the end zone — Gaziano has developed a reputation as a particularly hard-nosed rusher at the end of NU’s talented defensive line. The former Massachusetts Player of the Year in high school excelled while filling in for the injured Xavier Washington last fall. And following Washington’s arrest and ensuing indefinite suspension during the offseason, Gaziano seemed guaranteed to cement his starting role as a redshirt sophomore in 2017. One day during fall training camp, defensive line coach Marty Long pulled Gaziano aside for a chat to tell him he hadn’t arrived quite yet. The other expected starters — senior tackle Tyler Lancaster, junior tackle Jordan Thompson and freshman end Sam Miller — had earned their starting roles already, Long said. Gaziano hadn’t. After having “the conversation,” players generally react either by falling apart or by working harder, Long said, and in this case, Gaziano fell squarely into the latter category. Gaziano said he took a step back and refocused — perfecting his technique, upping his intensity and translating his in-the-weight-room leadership qualities onto the field. The renewed approach worked. Long said he recalled a day some time later in training camp when, while running a conditioning drill, the 280-pound Gaziano was one of the first players finishing each lap — time after time. “He wants it now, badder than he wants to breathe,” Long said he thought to himself. Gaziano ultimately did start in Week 1, recording a career-high four quarterback hurries against Nevada, and he hasn’t looked back. After recording just one sack in three nonconference games, Gaziano has five in six Big Ten games and is now tied for third in the conference in sacks per game. The sophomore has also contributed to NU’s stellar run defense by setting the edge and forcing speedsters like Penn State’s Saquon Barkley and Maryland’s Ty Johnson back inside, where they meet the waiting arms of the likes of Lancaster, Thompson and redshirt freshman linebacker Paddy Fisher. Thanks to the effective scheme, the Cats have allowed the 13th-fewest rush yards per game in the nation. Gaziano’s success can be traced all the way back to his offseason mindset shift, he said. Just over a year after his first career sack, Gaziano reintroduced himself to Lewerke this fall, bringing the Spartans’ quarterback down early in the second quarter of the Oct. 28 game. Hours later, he played a vital part in NU’s triple-overtime walk-off win, stripping Lewerke after a relentless pass rush off the edge — taking the young lineman’s budding reputation up yet another level. Since then, Gaziano said he’s worked on becoming a mentor to the younger defensive linemen, passing on the lessons he learned from Dean Lowry and Deonte Gibson in 2015 and C.J. Robbins last year. Those younger linemen have listened to Gaziano too, Long said, and the coach has a theory why.